The Ultimate Music Guide: Pink Floyd, tracks the band’s history from its early days as psychedelic pioneers and cult favourites of London’s hippy underground to multi-million selling super-brand they became with Dark Side Of The Moon and The Wall. As usual, the Uncut team have raided the NME and Melody Maker archives to reprint, in full, a wealth of extraordinary interviews, unseen for years, including the last-ever interview with the band’s charismatic but troubled original songwriter and guitarist, Syd Barrett. 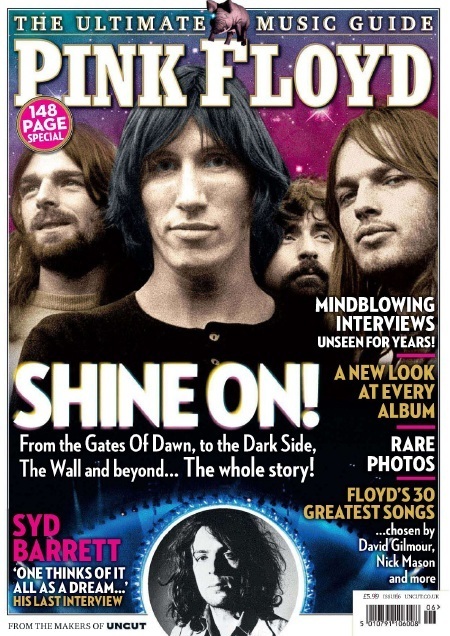 Meanwhile, Uncut’s current roster of fine writers provide authoritative new reviews of every Floyd album, to go alongside many rare and beautiful photographs. A treasure trove of wisdom, outrage and remarkable images, from the makers of Uncut – that’s The Ultimate Music Guide: Pink Floyd. I used to subscribe to this mag years ago. Never thought I’d be able to D/L it. Brilliant! Love the Floyd. Cheers, Pepe! Peace.